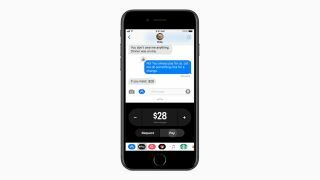 Back in September we were a little bummed to learn that iOS 11 was launching without Apple Pay Cash, Apple's peer-to-peer Venmo competitor that lets you send cash to friends. As TechCrunch reports, though, the service is now available through the iOS 11.2 beta, but both you and the person you're sending money to will have to have the public beta installed on your iOS device in order for Apple Pay Cash to work. For now, at least, the service only works for US iOS customers. Betas are volatile by their very nature, and there's always a slight chance of bricking your phone, so we wouldn't recommend it unless you're a developer. And now that we've gotten that little disclaimer out of the way, here's the link to sign up for Apple's public betas. The actual Apple Pay Cash option is easy to find, too. Apparently all you need to do is open the Messages app used for SMS texts, and you'll find a button for Apple Pay when you click on the Apps button next to the space where you write your messages. You'll need to have at least $10 in your account to use it, and two-factor authentication needs to be enabled. The process of sending money should be relatively instant, as it's working off of the same debit and credit card accounts you likely already have linked for Apple Pay. No fees apply for debit cards, but you'll have to pay an "industry standard" fee for credit cards. Interestingly enough, you'll apparently also be able to send money through Contacts and Siri. Based on personal experience, though, you'd be wise to make sure Siri understands that you're saying $15 instead of $50 before you let the cash go.